Antique Victorian engagement ring with rose cut diamonds and cabochon opals: Description by Adin Antique Jewelry. 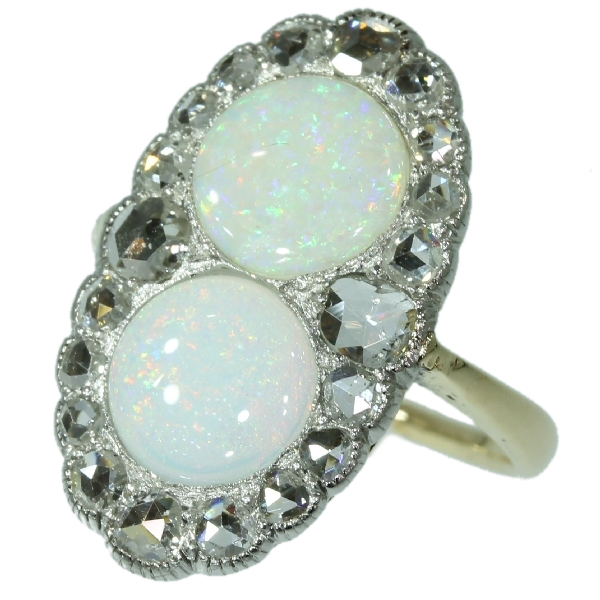 In this Victorian cluster ring from 1890, the two central cabochon cut opals seem to just keep on duplicating. With the glistening of 20 surrounding rose cut diamonds set in platinum, this whimsical jewel from 1890 could be your personal wishing well full of red, green and blue shimmers meant to grant you more of everything. Material: Two tones of precious metal, the main part being 14K yellow gold and the white part is platinum. Diamonds: 20 rose cut diamonds. We do not have the weight of the diamonds which is normal in our trade when it comes to rose cuts. Birthstones: Diamond is the birthstone (or month stone) for April and opal for October.